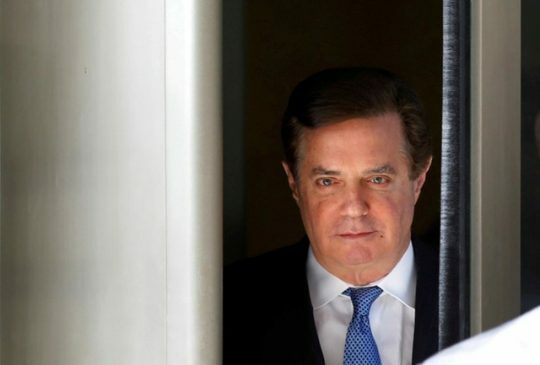 ALEXANDRIA, Va. (Reuters) – Former Trump campaign chairman Paul Manafort was convicted on Tuesday of eight counts of financial wrongdoing, giving Special Counsel Robert Mueller a victory in the first trial arising from his investigation of Russia’s role in the 2016 U.S. election. While the charges against Manafort mostly predate his work on President Donald Trump’s 2016 election campaign, legal analysts said the verdict was largely a victory for Mueller. Trump has repeatedly denounced the special counsel’s investigation. Trump, arriving in West Virginia for a rally on Tuesday night, tried to distance himself from Manafort’s conviction, saying it did not involve him. "Paul Manafort is a good man. … It doesn’t involve me, but I still feel – you know, it’s a very sad thing that happened," Trump said. "This has nothing to do with Russian collusion. This started as Russian collusion; this has absolutely nothing to do – this is a witch hunt and it’s a disgrace." Manafort, once a powerful Republican political operative, stood quietly while the verdict was being read by the clerk. Manafort’s lawyer, Kevin Downing, told reporters afterward that his client was disappointed in the verdict and was evaluating his options. Mark Warner, the senior Democrat on the U.S. Senate Intelligence Committee, said in a statement that the Manafort verdict refuted Trump’s repeated charge that the Mueller investigation was a witch hunt. He warned that any attempt by Trump to use his presidential powers to pardon Manafort or interfere in Mueller’s probe "would be a gross abuse of power and require immediate action by Congress." Republican Senator Lindsey Graham said in a statement that the Manafort and Cohen cases showed the "American legal system is working its will." He added that "there have yet to be any charges or convictions for colluding with the Russian government by any member of the Trump campaign in the 2016 election." Graham issued what appeared to be a caution to Trump against meddling in Mueller’s investigation, saying: "It’s important to let this process continue without interference." Ellis gave the prosecution until Aug. 29 to decide whether to retry Manafort on the charges on which the jury deadlocked. As a result, the judge did not set a sentencing date for the other charges. After the jury was dismissed, the judge told Manafort to stand at the podium and told him to help prepare the sentencing report. "The government and Mr. Manafort received very effective and zealous representation," the judge said. Ellis asked jurors whether they would like to have their names remain secret and they said yes. He told them, however, that they could speak publicly about the case if they wanted. The verdicts completed a stunning fall for Manafort, a well-known figure in Republican politics for decades. While Trump has sought to play down his connections to him, Manafort worked for five months on Trump’s 2016 campaign during a pivotal period in the presidential race, including three months as chairman. This entry was posted in Politics and tagged Paul Manafort. Bookmark the permalink.